There is nothing we enjoy more than sharing our campus and classrooms with prospective families. Please check out our 2018-2019 preview schedule or schedule a campus tour by contacting Joy Phelps at 253.284.8602 or joy_phelps@aw.org. The application includes a non-refundable $80 application fee. The Teacher Recommendation Request is embedded in the online application and requires the child’s current teacher’s email address. 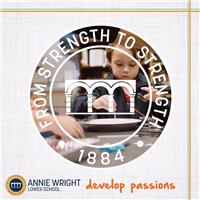 INTERNATIONAL APPLICANTS: Annie Wright Schools offer I-20 materials to students starting in Kindergarten. Families are required to provide an official bank statement and a copy of the student's passport. Boarding begins in Grade 9. Until then, international students must live with a family member or host family. Applicants participate in a group play session during which we observe candidates interacting with other children and assess school readiness. Group Play happens each February. At this time of the year, we schedule classroom visits in lieu of the Group Play. Applicants to Kindergarten must also have an individual assessment (we use the Gesell) to help determine developmental readiness for school. The assessment provides an opportunity to observe the applicant in several areas including language and cognitive thinking. Please call Joy Phelps at 253.284.8602 to schedule. The Official School Transcript Request is included in the online application and goes automatically to your child’s school. We require last year’s and this school year’s transcript (to date). The Teacher Recommendation Request is included in the online application and requires the child’s current teacher’s email address. An important part of the admission process is your child’s class visit. Whether a child has toured or visited prior to applying, applicants spend a day at school paired with a peer buddy. This allows applicants to get acquainted with Annie Wright Schools and serves as an important step in determining the right fit for your child. We serve a complimentary snack and lunch, but applicants may bring food from home if they prefer. Call Joy Phelps at 253.284.8602 to schedule. Academic assessments typically occur during the class visit day. Depending on the grade, testing can last up to an hour and half. For questions or to schedule a campus tour, contact Lower & Middle School Admissions Director Joy Phelps at 253.284.8602 or joy_phelps@aw.org. Check out our Lower School brochure.